Draft: 2010, Seattle Mariners, 8th rd. Jabari Jerrell Blash...Follow on Twitter: @JabariBlash ... Ranked #11 prospect in the Mariners organization by Baseball America following the 2015 season ... Originally signed by Mariners scout Mike Tosar ... Attended Miami Dade (FL) Community College from 2009-10 ... Graduated from Charlotte Amalie High School in St. Thomas, U.S. Virgin Islands in 2008. Split season between Padres and Triple-A El Paso...Set career highs in nearly every offensive category ... Promoted Apr. 7 for first of four stints with San Diego...Combined to appear in 61 games with Padres ... Posted a .290 average (20-for-69) against left-handers, compared to .158 (15-for-95) against right-handers ... Batt ed .298 (14-for-47) with four doubles, two home runs, 10 RBI, 10 runs scored and six walks in a 16 game stretch across the month of July ... Achieved a career-high seven game hitting streak from Sept. 14-20...Owned a .458/.517/.833 line during that time ... Marked his highest batting average (.285) for his eight-year minor league career over 72 games with El Paso. Made first career Opening Day roster in first season with Padres...Was acquired by Oakland in Rule 5 Draft and traded to San Diego the same day ... Appeared in 38 games for San Diego and made 16 total starts...14 starts came in right field and two in left field ... Made Major League debut in season opener on Apr. 4 vs. Dodgers...Entered game as part of a double-switch and drew a walk in first MLB plate appearance ... Earned first Major League hit with a pinch-hit double off Jason Gurka on Apr. 9 vs. Rockies ... Designated for assignment on May 13 and returned to Seattle...Was immediately reacquired by San Diego for a PTBNL and was assigned to Triple-A El Paso ... Played in 62 games with Chihuahuas...Batted .260 (46-for-177) with 12 doubles, 11 HR, 30 RBI, 41 walks and 30 runs scored ... Recalled by Padres July 31 and hit first Major League home run, Aug. 3 vs. Milwaukee (solo HR off David Goforth). Split the season for a second-straight year between Double-A Jackson and Triple-A Tacoma, hitting a combined .271 (110-for-406) with 24 doubles, two triples, 32 home runs, 81 RBI and 79 runs scored in 116 games....Began the year with Triple-A Tacoma, hitting .167 (6-for-36) in 11 games for the Rainiers before being transferred to Double-A Jackson....In his first month with Jackson, hit .326 (29-for-89) with nine home runs and 23 RBI in 24 games in May....Named a Southern League Mid-Season All-Star for Jackson....After being transferred back to Tacoma, hit .276 (16-for-58) in 15 games in July before hitting .290 (29-for-100) with 14 home runs and 27 RBI over 29 games in August, being named Pacific Coast League Player of the Month for August. 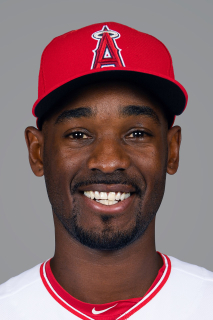 November 29, 2018 Los Angeles Angels released RF Jabari Blash. September 4, 2018 Los Angeles Angels recalled RF Jabari Blash from Salt Lake Bees. August 24, 2018 Los Angeles Angels optioned RF Jabari Blash to Salt Lake Bees. August 21, 2018 Los Angeles Angels recalled Jabari Blash from Salt Lake Bees. July 27, 2018 Los Angeles Angels optioned RF Jabari Blash to Salt Lake Bees. July 13, 2018 Los Angeles Angels recalled Jabari Blash from Salt Lake Bees. July 5, 2018 Los Angeles Angels optioned RF Jabari Blash to Salt Lake Bees. July 4, 2018 Los Angeles Angels recalled Jabari Blash from Salt Lake Bees. June 18, 2018 Los Angeles Angels optioned RF Jabari Blash to Salt Lake Bees. June 11, 2018 Los Angeles Angels recalled Jabari Blash from Salt Lake Bees. May 10, 2018 Los Angeles Angels optioned RF Jabari Blash to Salt Lake Bees. May 6, 2018 Los Angeles Angels recalled Jabari Blash from Salt Lake Bees. March 16, 2018 Los Angeles Angels optioned RF Jabari Blash to Salt Lake Bees. February 21, 2018 New York Yankees traded RF Jabari Blash to Los Angeles Angels for Player To Be Named Later. February 20, 2018 New York Yankees designated RF Jabari Blash for assignment. December 12, 2017 New York Yankees traded 3B Chase Headley, RHP Bryan Mitchell and cash to San Diego Padres for RF Jabari Blash. December 1, 2017 RF Jabari Blash assigned to Charros de Jalisco. August 19, 2017 San Diego Padres recalled RF Jabari Blash from El Paso Chihuahuas. July 30, 2017 San Diego Padres optioned LF Jabari Blash to El Paso Chihuahuas. July 14, 2017 San Diego Padres recalled Jabari Blash from El Paso Chihuahuas. May 9, 2017 San Diego Padres optioned LF Jabari Blash to El Paso Chihuahuas. April 24, 2017 San Diego Padres recalled Jabari Blash from El Paso Chihuahuas. April 14, 2017 San Diego Padres optioned RF Jabari Blash to El Paso Chihuahuas. April 7, 2017 San Diego Padres selected the contract of Jabari Blash from El Paso Chihuahuas. January 25, 2017 San Diego Padres sent RF Jabari Blash outright to El Paso Chihuahuas. January 20, 2017 San Diego Padres designated Jabari Blash for assignment. December 5, 2016 OF Jabari Blash assigned to Leones del Escogido. October 3, 2016 San Diego Padres activated RF Jabari Blash from the 15-day disabled list. August 22, 2016 San Diego Padres placed RF Jabari Blash on the 15-day disabled list retroactive to August 19, 2016. Sprained left middle finger. July 31, 2016 San Diego Padres selected the contract of LF Jabari Blash from El Paso Chihuahuas. May 18, 2016 San Diego Padres sent LF Jabari Blash outright to El Paso Chihuahuas. May 13, 2016 San Diego Padres designated LF Jabari Blash for assignment. December 10, 2015 Oakland Athletics claimed RF Jabari Blash off waivers from Seattle Mariners. December 10, 2015 Oakland Athletics traded LF Jabari Blash to San Diego Padres. To complete the December 2 trade. September 20, 2015 RF Jabari Blash assigned to Tigres de Aragua. July 16, 2015 RF Jabari Blash assigned to Tacoma Rainiers from Jackson Generals. May 1, 2015 RF Jabari Blash assigned to Jackson Generals from Tacoma Rainiers. April 6, 2015 RF Jabari Blash assigned to Tacoma Rainiers from Jackson Generals. March 19, 2015 OF Jabari Blash assigned to Seattle Mariners. August 17, 2014 RF Jabari Blash assigned to Jackson Generals from Tacoma Rainiers. June 27, 2014 Tacoma Rainiers placed RF Jabari Blash on the restricted list. April 30, 2014 OF Jabari Blash assigned to Tacoma Rainiers from Jackson Generals. March 3, 2014 OF Jabari Blash assigned to Seattle Mariners. August 2, 2013 OF Jabari Blash assigned to Jackson Generals from High Desert Mavericks. July 3, 2013 Jabari Blash roster status changed by High Desert Mavericks. June 23, 2013 High Desert Mavericks placed RF Jabari Blash on the 7-day disabled list. May 3, 2013 High Desert Mavericks activated RF Jabari Blash from the 7-day disabled list. April 18, 2013 High Desert Mavericks placed RF Jabari Blash on the 7-day disabled list. April 3, 2013 RF Jabari Blash assigned to High Desert Mavericks from Clinton LumberKings. March 15, 2013 RF Jabari Blash assigned to Seattle Mariners. August 2, 2012 Jabari Blash roster status changed by Clinton LumberKings. July 29, 2012 Clinton LumberKings placed RF Jabari Blash on the 7-day disabled list. April 4, 2012 RF Jabari Blash assigned to Clinton LumberKings from Everett AquaSox. March 8, 2012 OF Jabari Blash assigned to Seattle Mariners. June 15, 2011 Jabari Blash assigned to Everett AquaSox from Clinton LumberKings. April 26, 2011 Jabari Blash assigned to Clinton LumberKings from Pulaski Mariners. July 25, 2010 Jabari Blash assigned to Pulaski Mariners from AZL Mariners. July 21, 2010 Jabari Blash assigned to AZL Mariners from Seattle Mariners. July 20, 2010 Seattle Mariners signed OF Jabari Blash.